Moving to a new home or office and worried about how to keep your belongings safe? Here’s how hiring a professional moving service can help keep your valuables protected. Whether or not you are going to use a professional moving service. Organizing parking at both your current and new residence. Ordering cardboard boxes to start packing. Organizing temporary storage, if required. Clearing your home of items that are no longer needed. At Precision Movers, we can help you move offices or homes in an organized, efficient and safe way. From relocating pianos to safe moving, our team of movers in Calgary have the skill and expertise to meet all your unique requirements! We understand that having security and safety measures in place helps makes your transition a smooth experience and we’ll do everything we can to keep your belongings safe while you are moving. Moving to a new home or office can be both exciting and stressful. With contracts, deposits and other financial details to consider, it’s no wonder that you may struggle to keep on top of security for your belongings. 1. DON'T JUST CHOOSE ANY MOVERS IN CALGARY! If you have decided to use a professional moving service, it’s crucial that you vet any companies you are considering. Some unscrupulous movers can scam you with hidden fees, or even refuse to deliver your belongings until you’ve paid them. How long as your company been in business? Do your Calgary movers have the necessary skill and equipment? The more planning you do before your move, the easier it will be to keep track of any security measures you might have taken along the way. If you are traveling a long distance, consider any stops en-route and check that your vehicle can be securely parked in a well-lit area with CCTV. If you are using a moving service, confirm the pickup and drop-off times beforehand to make sure you avoid any nasty surprises. Keeping valuable and sentimental items on your person during the move. Investing in high-quality packing materials to keep your belongings safe and secure. Buying padlocks or ties to provide additional security for larger items. Moving things in smaller amounts, if you are worried about forgetting items. 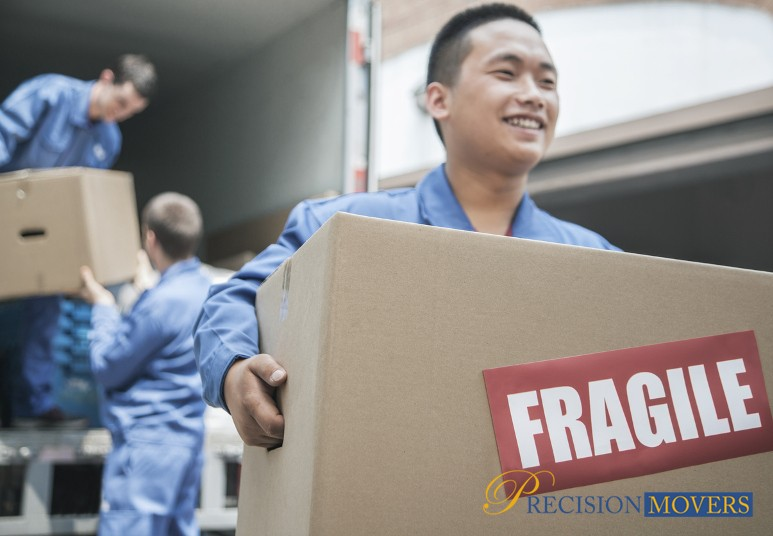 If packing correctly seems like a daunting task to you, contact Precision Movers today! Our Calgary team has the experience and knowledge to pack and handle your valuables correctly, saving you money, while ensuring your possessions are kept safe. Once you’ve got all of your belongings to your new property, it’s important to remain vigilant. Keep all vehicles containing your valuables locked, especially if they’re left on the street. DO NOT leave high-value items lying around as you unpack, as burglars have been known to target houses that have been recently moved into. To find out more about how our team of movers in Calgary can help make your office or home relocation easier, contact us at 403-540-4393 or fill in our online contact form.